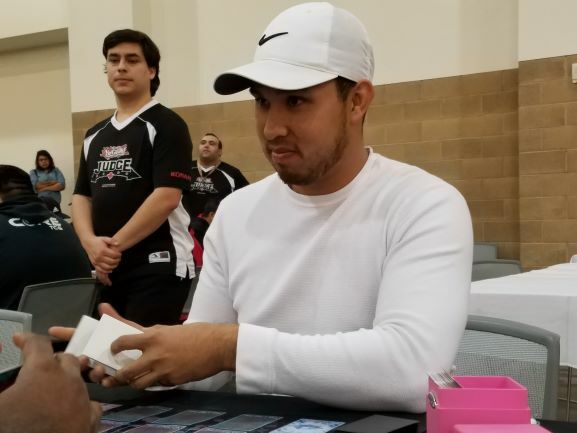 Carlos Talamantes is here from Stockton, playing a unique HERO Deck. He’s packing Mask Change, T.G. Striker and other Warriors that Special Summon, Miracle Fusion, and more. It’s a mix of all the best things HERO cards can do, and it can combo into Masked HERO Dark Law or Topologic Gumblar Dragon with ease. His opponent is Richard Barnett, from Los Angeles, playing Gouki. The Gouki Deck can struggle against Dark Law – will Barnett have an answer? Talamantes won the dice roll and played first, with a hand of two Super Quantum Red Layer, Infinite Impermanence, Junk Forward, and Elemental HERO Solid Soldier. He Special Summoned Red Layer and Junk Forward, using them to Link Summon Isolde, Two Tales of the Noble Knights to add Vision HERO Vyon to his hand. Isolde’s second effect sent Malevolent Nuzzler, Horn of the Unicorn, Moon Mirror Shield, and Divine Sword – Phoenix Blade to the Graveyard to Special Summon Elemental HERO Shadow Mist in Defense Position. Shadow Mist added Mask Change to his hand. He Set Mask Change and Infinite Impermanence to finish the turn. Barnett activated SPYRAL Super Agent in his hand, guessing Monster. Talamantes revealed his top card to be Red Layer! Super Agent hit the field, destroying Infinite Impermanence. Barnett Normal Summoned Gouki Headbatt, and Talamantes flipped Mask Change. He turned Shadow Mist into Masked HERO Dark Law! Shadow Mist’s effect added Elemental HERO Stratos to his hand. Barnett continued, using Instant Fusion to bring Invoked Raidjin to the field. Raidjin turned Dark Law face-down, leaving Barnett free to continue his play sequence. He used Raidjin and Headbatt to play Isolde. Headbatt and Isolde added Gouki Suprex and Junk Forward to his hand, respectively. Then, Isolde sent Phoenix Blade, D.D.R. – Different Dimension Reincarnation, and Living Fossil to the Graveyard to Special Summon Neo-Spacian Aqua Dolphin! It discarded Destiny HERO – Malicious, forcing Talamantes to reveal his hand. Barnett chose to make him destroy Stratos. Barnett used Isolde and Aqua Dolphin to play Summon Sorceress, which Special Summoned Gouki Twistcobra. He used that with Super Agent to play Knightmare Phoenix, and Twistcobra searched out Gouki Re-Match. Malicious Special Summoned another copy of Malicious, and that was used with Summon Sorceress to play Firewall Dragon. Barnett then returned Phoenix Blade to his hand. He used Phoenix to play Knightmare Mermaid, discarding Phoenix Blade for its effect to Special Summon Knightmare Corruptor Iblee and draw a card. Firewall Special Summoned Suprex from his hand. He used Iblee and Suprex to play Binary Sorceress. 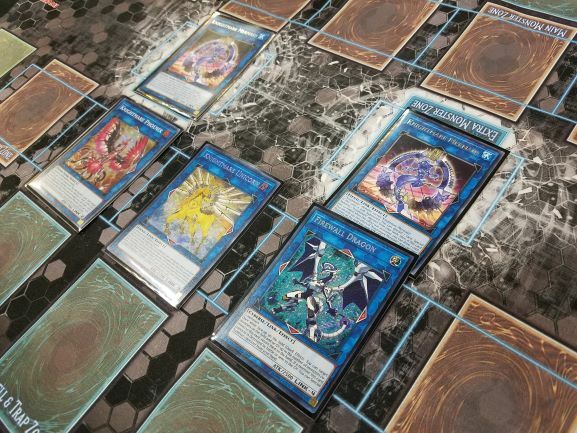 Suprex added Gouki Octostretch to his hand, and Firewall Chained to that to add Aqua Dolphin and Iblee to his hand, then Special Summoned Octostretch. He used Octostretch to play Linkuriboh, and Firewall Special Summoned Gouki Riscorpio. 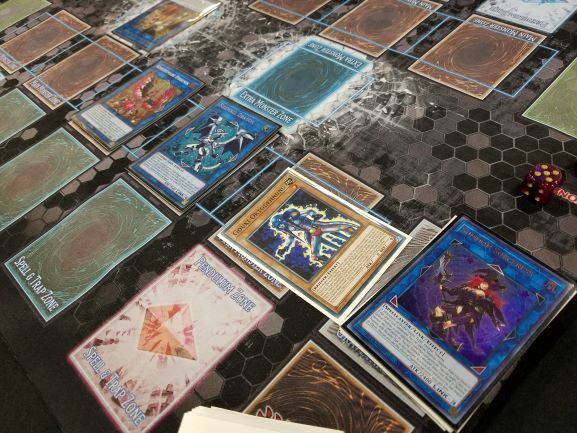 He used Linkuriboh and Riscorpio to play Knightmare Phoenix, and Riscorpio added a new Octostretch to his hand. Firewall Special Summoned Aqua Dolphin, discarding Instant Fusion to destroy the Red Layer from Talamantes’s hand. 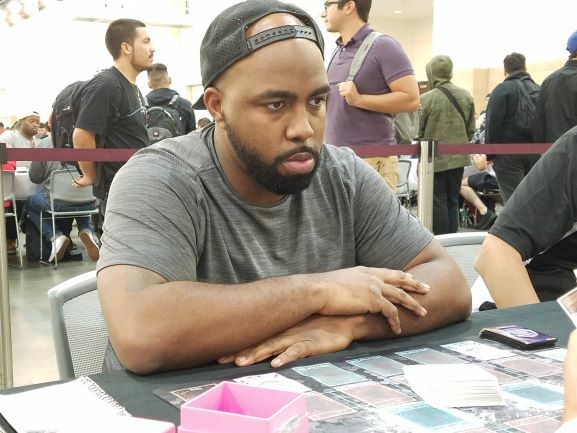 He used Aqua Dolphin with Binary to play Knightmare Unicorn, discarding Junk Forward to bounce away Talamantes’s Isolde, and Firewall Special Summoned Iblee. He used Iblee to play a second Knightmare Mermaid forming an Extra Link. He was going to continue, but Talamantes knew that he wouldn’t be able to fight back now that Barnett had made an Extra Link – he conceded the first Duel! Talamantes began the second Duel with a hand of Junk Forward, Mask Change II, E – Emergency Call, and two Destiny HERO – Malicious. He started with Emergency Call to add Elemental HERO Stratos to his hand. He Special Summoned Junk Forward, then followed up with Stratos to add Elemental HERO Solid Soldier to his hand. He used his Warriors to play Isolde, adding Elemental HERO Blazeman to his hand. Isolde’s second effect sent Horn of the Unicorn, Moon Mirror Shield, Malevolent Nuzzler, and Phoenix Blade to the Graveyard, and Barnett negated Isolde with Ash Blossom & Joyous Spring! Talamantes passed the turn! Barnett Normal Summoned Suprex, which Special Summoned Octostretch. He played Isolde, using his three effects to add Gouki Re-Match, Headbatt, and Suprex to his hand. He used Isolde’s second effect, sending Phoenix Blade to the Graveyard to Special Summon Octostretch. He discarded Suprex to Special Summon Headbatt, then used Octostretch and Isolde to play Summon Sorceress. It Special Summoned Riscorpio, and he used his two Goukis to play Knightmare Phoenix, adding Twistcobra and Headbatt to his hand with the Gouki effects. Gouki Re-Match brought Octostretch and Headbatt back, and he used Headbatt with Summon Sorceress to play Firewall Dragon. Talamantes knew what Firewall Dragon meant; he conceded! Richard Barnett takes the Match with Gouki!